Kids Carpet Playmat Rug Play Time! 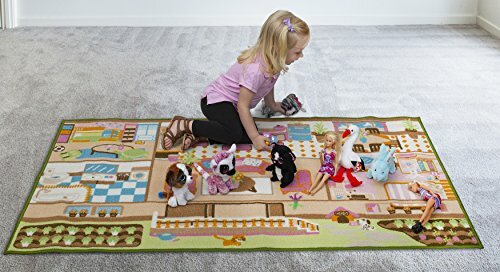 Fun House Great For Playing With Dolls Mini People Figures Cars, Toys - Learn Educational Play Safe & Have Fun - Children Play Mat,Play Game Area Includes 3D Rooms! This Play ground style house will Guarantee to keep your kids busy for hours with self entertainment and will provide you and your children with many hours of enjoyment. It features bright colors with lots of different rooms and settings giving the possibility of a few kids playing at the same time. Teaches your kids social skills from a young age with the very real idea of a house! Features a very thick quality rug with a safe anti skid latex backing. If you have any questions about this product by Nessie Playground, contact us by completing and submitting the form below. If you are looking for a specif part number, please include it with your message.